This weekend’s NextGen tribute wraps up with — what else? 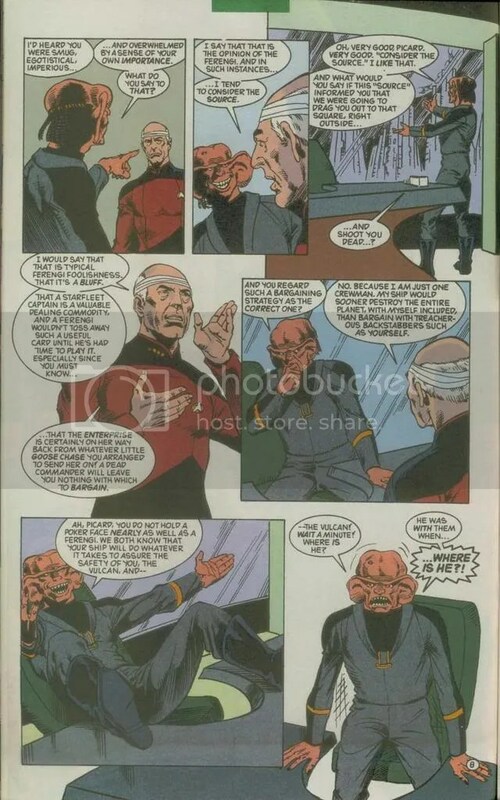 — Jean-Luc Picard giving a Ferengi a tongue-lashing. By the way, “the Vulcan” is everyone’s favorite ambassador/former Enterprise captain, participating (along with Admiral McCoy) in Trek’s first semi-official intergenerational crossover. Of course no Ferengi jail can hold him! The glowy-headed guys in the armor are Tholians. 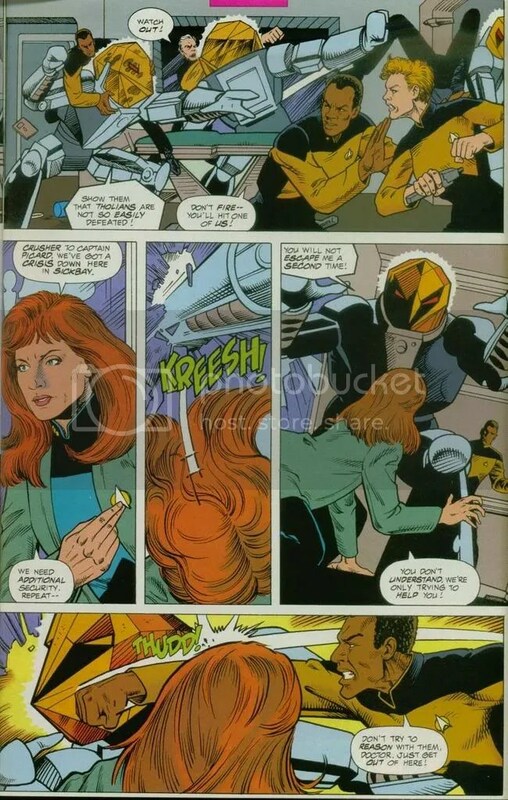 According to DC’s old TNG title, the suits help them survive in a human-friendly environment. Good thing Picard (…huh?) 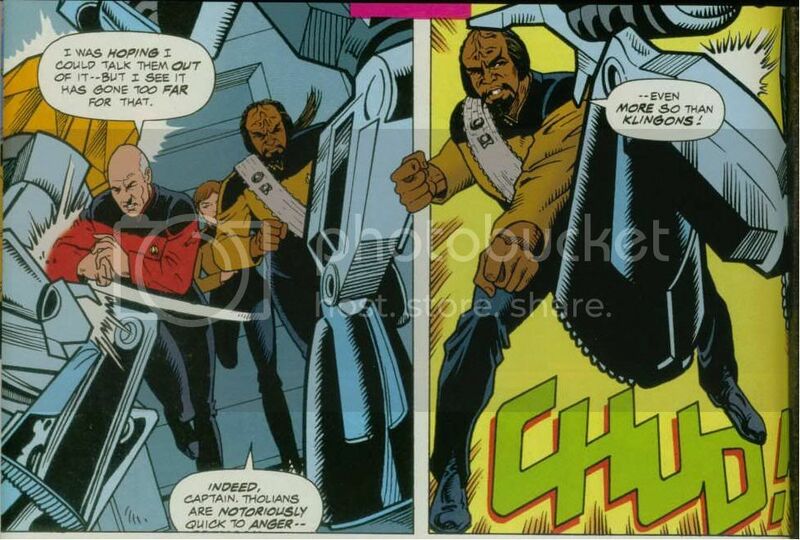 and Worf are there to hand out some punishment! It’s all part of the United Federation of Bahlactus! Twenty years ago today, “Star Trek: The Next Generation” premiered in syndication with the two-hour “Encounter At Farpoint.” I didn’t like it much at first. Oh, I liked the effects. I liked the design of the new Enterprise, and I really liked the title sequence, which brought back the opening narration and Jerry Goldsmith’s ST:TMP theme. I liked Captain Picard and Data. 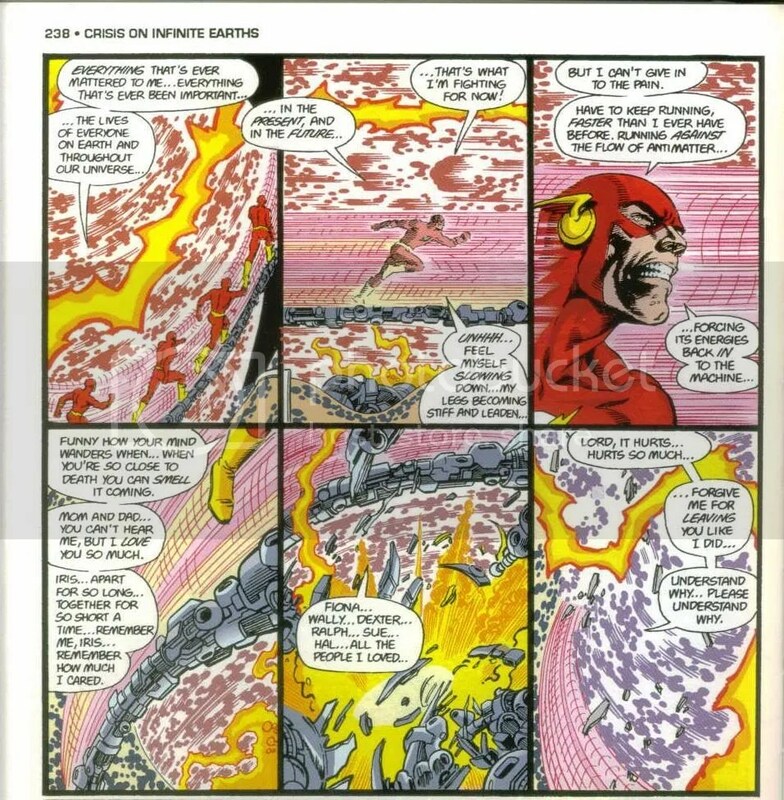 However, the rest of it seemed to owe too much to the original series — not just the three uniform colors, but the style of the show itself. By the mid-‘80s, series like “Hill Street Blues,” “St. Elsewhere,” and “L.A. Law” had redefined the hour-long drama, and even shows like “The A-Team” had brought a certain self-awareness to hour-long action series. Next to those, early TNG was stuck firmly in the ‘60s and ‘70s. It was as if it didn’t feel the need to keep up with its peers, as long as it replicated the feel of its inspiration. Accordingly, early TNG could be painful to watch, but I didn’t hate it; and I wasn’t rooting actively for it to fail. Whatever its shortcomings, it still felt like Star Trek. Besides, the longer it was around, the more opportunity it had to get better; and indeed, towards the back half of the first season, it did. Over the break, a two-hour special (called “From One Generation To The Next,” I think) traced the history of Star Trek and teased the second season of TNG. 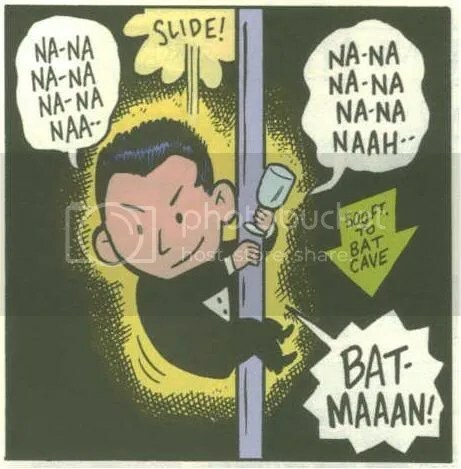 In 1988, I’m not sure what the occasion would have been, but the special (narrated by Patrick Stewart) featured the first all-color edition of “The Cage,” and it probably meant a new home-video release. Anyway, Season Two looked to be a bit more loose, with Riker sporting a beard, Diana Muldaur replacing Dr. Bev, and Troi’s hair freed from that bun. However, a TV writers’ strike put it off until just before Thanksgiving, making the six months between seasons seem interminable. 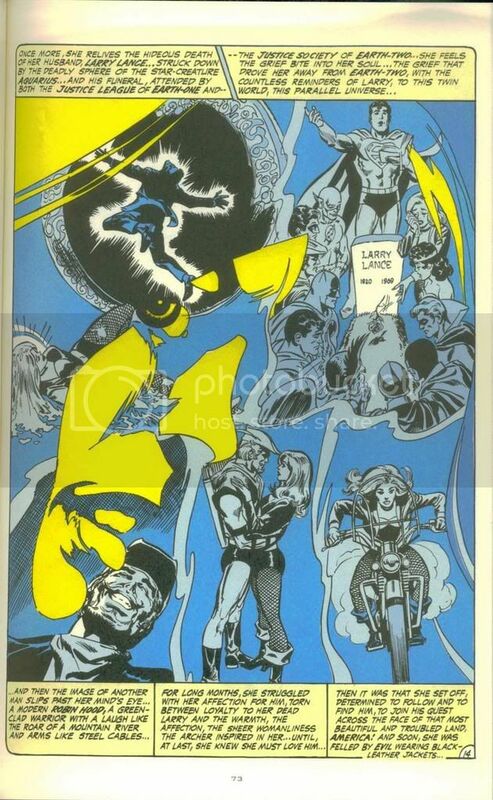 The strike also meant that Season Two’s 22 episodes (well, 21 plus the clip show “Shades Of Gray”) got stretched out over nine months, until mid-July ‘89. With Season 3 starting in the last week of September, the hiatus was pretty short. And, of course, with Season 3, TNG stepped on the gas and never looked back. Original Trek got worse as it got older, but TNG established the “wait for the third season” rule, which fans applied (with varying degrees of success) to later Trek series. Season Three may be remembered best for its apocalyptic episodes “Yesterday’s Enterprise” and “The Best Of Both Worlds, Part I,” but it also had a couple of funny Ferengi episodes (“The Price” and “Menage A Troi”), good Romulan episodes (“The Enemy” and “The Defector”), and the start of the Klingon-politics subplot (“Sins of the Father”). Generally, the ratio of good episodes to mediocre ones seemed significantly better. I was a student at the University of Kentucky for all seven years of TNG’s run. I was a freshman in Season One, graduated right before the end of Season Four, started law school with Season Five, and took my first bar-review class the day of “All Good Things.” My first glimpse of the new Enterprise was on a dorm-lounge TV, and I remember walking home from a football game to watch the tape of “Redemption, Part II.” It’s an odd correlation into which I don’t want to read too much. More than anything else, it makes both my UK experiences and TNG easier to remember. Still, things did pick up for me personally in junior year (Season 3) and beyond. Of course, TNG also found fans in a number of my classmates, so it was a boon to my social life (certain parts, at least). We got together to watch the conclusions of “Unification” and “Descent,” caught “Parallels” at a Christmas party (between old Rankin/Bass tapes), and stood in line for tickets to Star Trek VI. Because TNG aired regularly on Saturday nights at 7:00 p.m., often it came on before a UK basketball game. I will always associate “Starship Mine” with the 1993 Final Four matchup between Kentucky and Michigan. Kentucky lost in overtime, but “Starship Mine” is still good. Besides, one of my good friends from law school is a Michigan grad and a Trek fan, so I’m sure he was doubly happy. Overall, the TNG movies were uneven. First Contact is the best, but it still has some problems. Generations and Insurrection were uneven, and Nemesis didn’t seem to want to have much fun. Like TNG in general, they’re all worth watching for Patrick Stewart and Brent Spiner’s performances. Indeed, I doubt we’d be celebrating TNG’s 20th as lustily were it not for Patrick Stewart. He classed up Star Trek enough to get it away from the stereotype (deserved or not) of Shatnerian acting. When the rumors flew in the summer of 1990 that “Best Of Both Worlds” was a way to write Stewart out of the show, I wondered how well it would do, really, with Captain Riker and Cmdr. Shelby as the headliners. To me, Stewart was TNG’s best asset because I got the feeling he didn’t have to do Star Trek. With movies like Excalibur, Dune, and Lifeforce on his resume, it’s not like was a stranger to SF/F, but still. TNG flew its nerd flag pretty high sometimes, and Patrick Stewart not only sold it, he made it look good. TNG wrapped up five years ago with Star Trek Nemesis, which killed Data and promoted the newlywed Riker and Troi off the Enterprise. As vital as I think Picard is to the TNG dynamic, breaking up the crew tends to scuttle any interest I might have in future adventures. I was never that curious about Picard commanding the Stargazer, so with half the TNG cast gone, his further adventures aboard the Enterprise would feel more like that. Picard is such a solitary person that despite the presence of Beverly, Worf, and Geordi, I can’t help but think of him as isolated without Riker, Troi, and Data to help draw him out. Regardless, it’s good that TNG got a definite ending. I think it’s the only Modern Trek series so far which can really say that. “DS9” hinted at Sisko’s return, “Voyager” denied viewers the aftermath of the ship’s return, and I hope most of “Enterprise’s” last episode was holo-puffery. TNG definitely got the most coverage of any Trek series, such that I can’t imagine anyone in another 20 years wanting to remake it to fill in the gaps. I don’t know if that’s the highest compliment I can pay to the show, but it’s up there. After a shaky start, TNG proved to be a worthy successor to an iconic series, which allowed fans to explore pretty thoroughly the Star Trek format’s potential. It didn’t do everything right, but it set a high standard. For a show where the sky was the limit, that’s not too shabby. P.S. I can’t wrap this up without mentioning Siskoid’s excellent recaps of what look to be every Trek episode and film. Someday I’ll stage my own five-series mega-marathon, from “Enterprise” to Nemesis, but I’ll probably be too tired to blog about it! 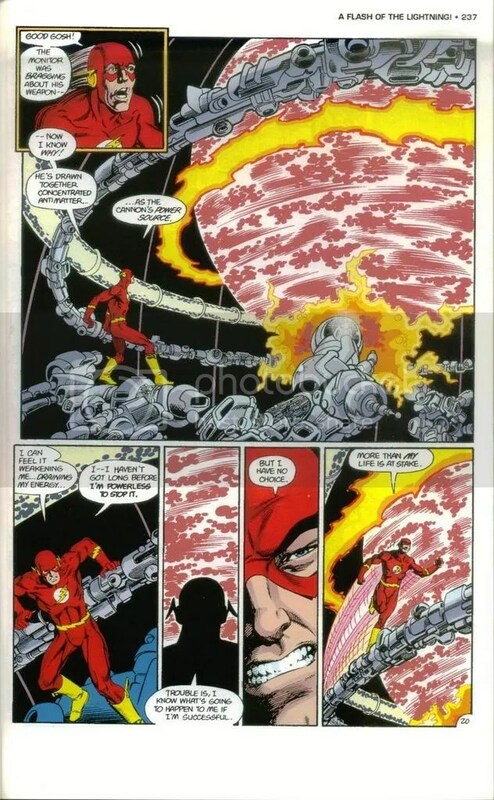 The 20th anniversary of “Star Trek: The Next Generation” is upon us, so here’s a sample of DC’s comic-book version. 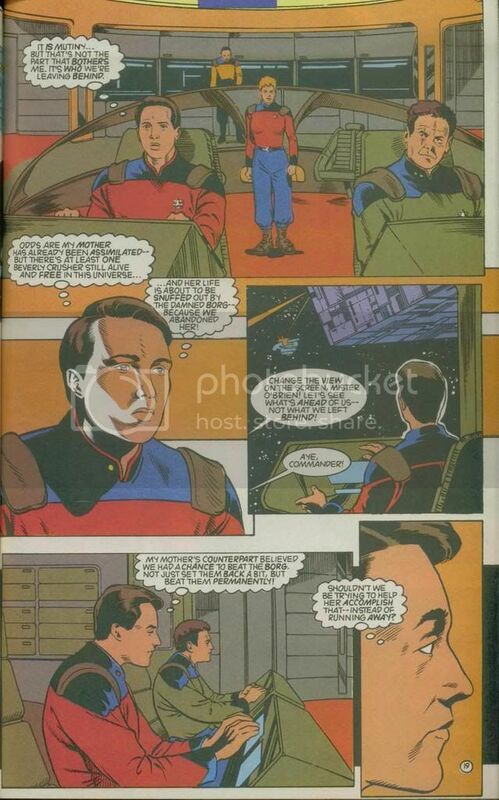 This alt-universe Wesley Crusher and his shipmates failed to rescue Picard from the Borg. Now Alt-Shelby has hijacked “our” Enterprise, abandoning our crew to attack the Borgified Earth, and Alt-Wesley is doing some serious THINKING–! We’ve been assimilated by Diamondrock! In fact (if we’re being charitable), it might look like both men are a bit reckless — no! you don’t mean it! — but actually, they’re each thinking a couple of steps ahead! Hal knows Ollie has enough time to shatter the hourglass, despite it hurtling towards Earth at 32 feet per second per second; and Ollie knows Hal is ready to catch them in a power-beam construct. I’m holding out for the upcoming Mattel Aquaman (classic orange outfit), and I’ll probably get a Martian Manhunter at some point. I’d also like to replace Batman and Superman with figures who are more in scale with the rest. Still, I probably won’t add much more than that. There’s just not that much more room on the shelf! I have an idea of who’ll make the cut, but thought I’d throw it out to the select few who visit here. I don’t think I left anyone out. 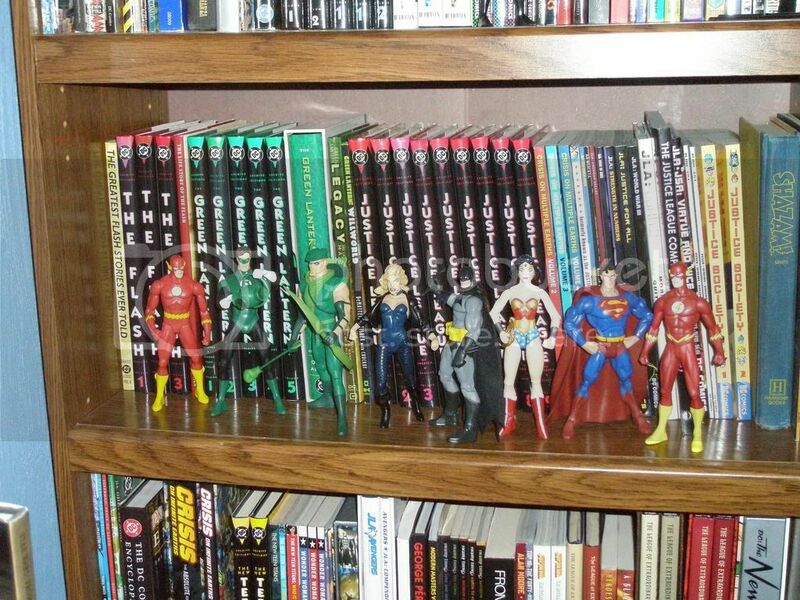 There is a Zauriel figure, but it’s from the Hasbro “Total Justice” line and not in scale with these. The Zatanna figure in her period-appropriate blue-and-white superhero outfit is from the Identity Crisis line, so all her proportions are off. I’d have preferred that costume, because it reflects her time in the Satellite League, but I’ll settle for the fishnets. I’ve seen John Stewart figures in classic and current costumes, and would use either one. 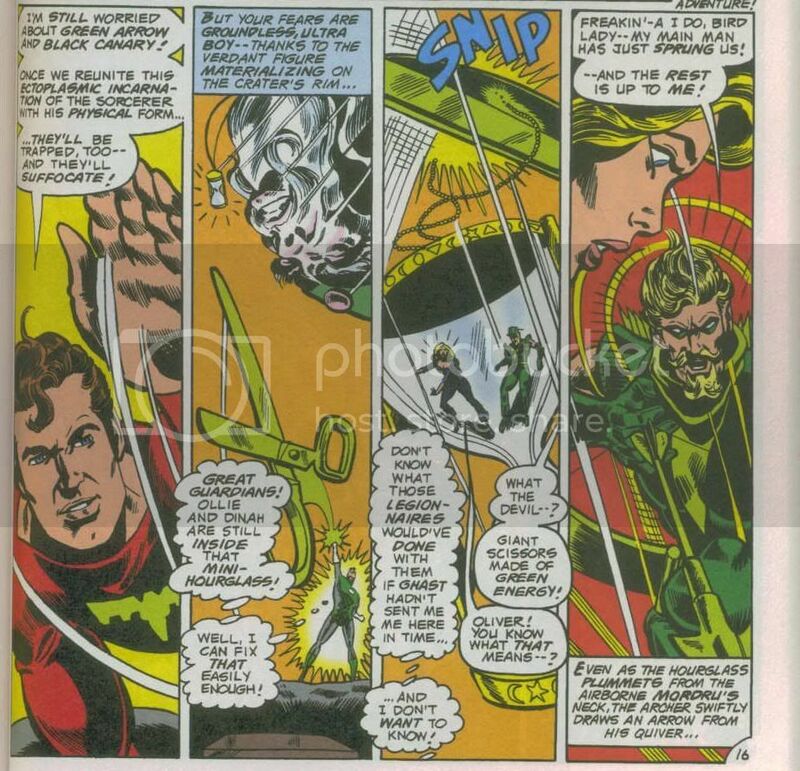 When Green Lantern and Green Arrow catch up to her, of course it starts her THINKING–! I’ll try to find a comparable shot of Ollie thinking happy thoughts about Dinah, but somehow I think that’ll be harder….